Try our new Chat room. Drop in, ask questions, give me a URL or story idea you'd like to see. I will do my best to answer it and put it up on the site. From August 9 to 13th in Los Angeles, I spent much of my time there this week. 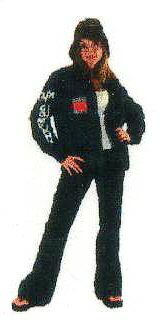 I have an in with Charmed Tech that put on the High Tech Fashion Show. I have tons to report on once I have a chance to digest it all. Ralph's TV coming to a supermarket near you. 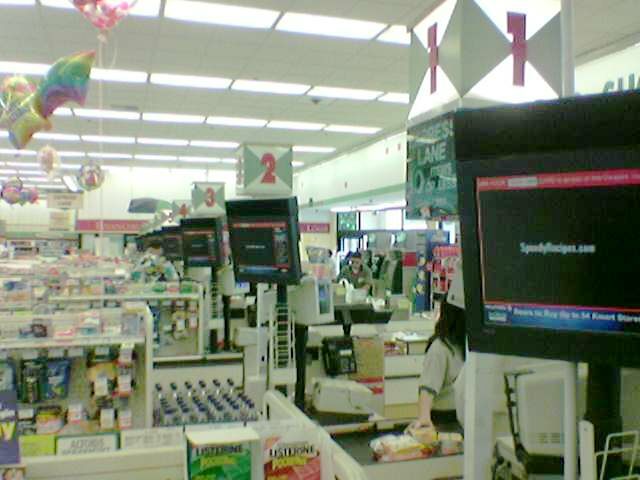 As you approch the checkout stand in some Ralph's Grocery you may notice the new big screen pointed your way, playing advertisements. They have installed an in-house advertising broadcasting system. Ralph's Grocery which only has stores in California is a subsidiary of The Kroger Co. with over 2,536 grocery retail stores in 32 states under nearly two dozen banners. The image below from from a Ralph's located in the Los Angeles Area. I hear Vons in Korea Town here also has similar screens. The Blu-ray Disc Founders, a consortium of 13 consumer products firms led by Sony, has formally approved the 1.0 specification of the BD-ROM physical format, which means the Blu-ray DVD format can has a set, stable format for its developers and companies wishing to develop BD-ROM-based software. BD-ROM is expected to ship to consumers around late 2005. This includes Blu-ray DVD players as well as BD-ROM drives for PCs. Philips, Hewlett-Packard and Dell are among the Blu-ray Disc Founders. The meeting, just held in Tokyo this week (8/10/04), wasn't just for the 13 BDR founders. More than 70 people representing 42 companies attended the first information seminar held in San Jose late last month, and 400 people from more than 200 companies attended the conference Tokyo conference earlier this month. The first official meeting of the Blu-ray Developer's Association will be held on October 4. Blu-ray is one of several formats competing to be the replacement of the DVD technology. The format officially endorsed by the DVD Forum, which helped steer DVD from the drawing board to the market, is HD-DVD, developed by Toshiba and NEC. Both use a blue lasers, which allows for denser packing of data. Blue light, with a shorter wavelength than the red laser used in conventional DVD recorders, can read and store data at the higher densities needed for high-definition recordings. Blu-ray discs have a higher capacity - 25GB on a single density disc vs. 15GB on a single-density HD-DVD disc - and it can also have more than two layers. 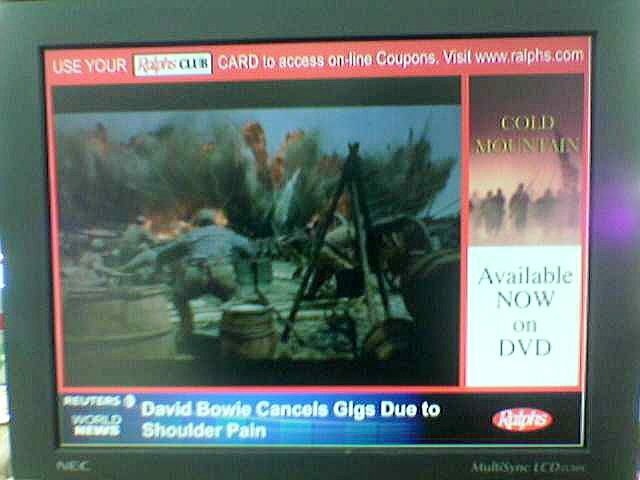 HD-DVD, like regular DVD, can have two layers, for double density discs. Blu-ray, however, has gone to four layers. TDK, which recently joined the BDA, has demonstrated a quad-density Blu-ray disc with 100GB of capacity and reportedly has a 200GB disc in the labs. That quad density disc is the equivalent to 10 standard double density DVD discs. This final specification just means the physical format is set. The codec and security system of Blu-ray is still not set, and other than Sony (Blu-ray) and Warner (HD-DVD), no studios have aligned themselves with either camp because they are waiting for final specifications on the inclusion of specific codecs, specifically digital rights management software. The New "Digital Cinema System Specification v.4.1b" August 10, 2004 (pdf) specification is available at DCI(Digital Cinema Initialtives) web site. Digital Cinema Initiatives (DCI), LLC is a limited liability company whose members include Disney, Fox, MGM, Paramount, Sony Pictures Entertainment, Universal and Warner Bros. The venture was formed in March 2002 and has its principal place of business in Hollywood, CA. The primary purpose of DCI is to establish and document an open architecture for digital cinema components that ensures a uniform and high level of technical performance, reliability and quality control. In June DCI selected for the D-Cinema Compression Scheme ISO/IEC 1544-1: 2000 Information Technology, (a.k.a. JPG 2000) image coding system, part one: large digital cinema image files. The Society of Motion Picture and Television Engineers (SMPTE) DC-28 committee is considering this now as the new standard. As a result of the DCI decision competing image compression systems, such as various MPEG standards, and relative newcomer eTreppid, will likely be eliminated from the running. Hey what happened to WM9? On a related note: Sony release in June a 10,000 ANSI Lumen projector SRX-R110 for $80,000. It has a 4096 x 2160 pixel resolution and high contrast ratio. This be being called at "4K" Projector. It uses an LCoS device called a Silicon X-tal Reflective Display (SXRD) imaging device that enables them to achieve nearly four times the pixel count of current HD displays. Sony first introduced SXRD technology in its QUALIA™ 004 projector. With SXRD technology, pixels are set at a pitch of 8.5 micrometers, from the center of one SXRD pixel to the center of the next, with an inter-pixel gap of 0.35 micrometers. DLP(Digital Light Processing) web site. Full of good info, run by Texas Instruments. The IQeye302 and 603 also support 1600x1200 resolution at 0.3 Lux with output up to 19 Mbps. Hasbro's VIDEONOW Player has sold more than 1.2 million VIDEONOW personal video players and more than 4 million VIDEONOW personal video discs. Hasbro just released their new Color player, it retails for around $75 with disks selling from $8 to $16 each. They now even have special little CD jewel boxes for there disks. These disks are just standardaudio CD's, and at least their older b/w version just recorded in the RED-BOOK Audio format where one of the stereo channels contained uncompressed grey scale video. I couldn't believe it worked as well as it did, it was cheap, simple and KISS (Keep it Simple and Stupid), I just can't help admired that design philosophy. 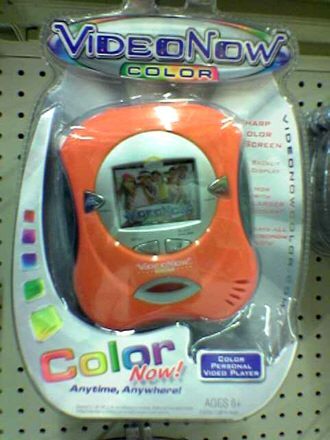 According to the Hasbro web site FAQ Each 4.25 inch VIDEONOW COLOR Personal Video Disc contains over 25 uninterrupted minutes of content/programming. 4.25 inch is a odd size indeed, since most CD's are 4.75 inches or 3 inches for the mini CD's. If someone can confirm this please drop me a note in the chat room. The player is 4.75 X 5.75 inches and only 1.25 inches thick. The Color player has a 1.85" x 1.45" backlit color LCD screen with a resolution of 216-by-160 pixels, a built-in speaker and a headphone jack. Yet no one is following this and few have ever even heard of it, because Hasbro is a kids toy maker and their player doesn't use sophisticated compression or special disks. In my option they are doing it right and gaining market share while enhancing their product based when they can take advantage of predictable sales volume. Compared to companies with Portable Media Players (past article) like Archos, RCA Lyra, Creative Labs NOMAD, Sony MSV-A1, GoVideo, ZVUE ,AVIAS or Gizmondo, the Hasbro product has a real shot at setting the standards in the next few years.